Welcome to Dee Sons Metal Industries. Manufacturer & Exporter of Construction Materials. We are an ISO 9001:2008 certified company, incepted in 1978, at Chandigarh. Our products are applicable in Power, Construction & other industries. Jay Pee & Soma Infrastructure are some of our elite clientâs and we are supported by Cutting edge technology & abrasion resistance. Our product list covers Cuplock Scaffolding, Support System & Scaffolding Tubes. 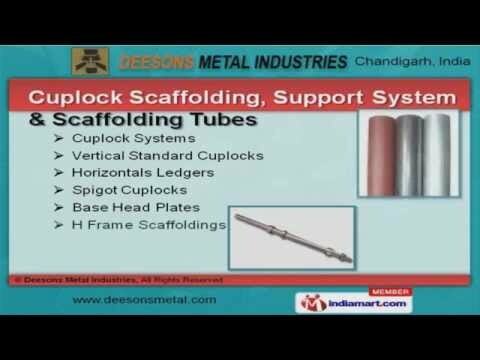 We are specialized in offering Cuplock Scaffolding, Support System & Scaffolding Tubes. Our assortment includes Verticals Shores, Props & Adjustable Jacks. We have been able to offer Wall Form System & Floor Forms Ranges. Adjustable Telescopic Spans & Shuttering Metal Plates offered by us are a class apart. Along with that we offer a qualitative range of Joint Pins & Industrial Couplers.